We offer a wide variety of media supplies to suit most every need,..... industrial, retail, commercial or compliance. Whether you need a custom full color process label in rolls, Anodized Aluminum tags or blank laser sheet labels, we can help. We are here to serve you in all your label, tag & ribbon needs. We specialize in high speed thermal media, so please click on the link below to tell us about your media need & we will get back to you within 24 hours with a custom quotation at the guaranteed lowest price for quality. Up to 17.5" wide labels can be made on our presses and with a warehouse of 20 years worth of dies there is a good chance we already have your size in stock. Thermal labels have become the standard for industrial labels. This is due to the wide acceptance of thermal printer technology (hi-speed, quiet printing). Thermal labels come in two types: Direct Thermal & Thermal Transfer. Labels that are coated with a coating that allows for a one pass ribbon to transfer a one color image to the top surface of the label. This image is more durable than that of the Direct Thermal labels, so this type of thermal label is best for labels that need to last for a longer period. This type of label can also be made of more durable materials, such as polypropeline, tyvex & polyester, with some of these labels being durable enough to withstand outdoor conditions of up to 5 years. A thermal transfer ribbon is the "ink" that a printer uses to print on your blank label stock. Depending on the type of label stock you are using will help determine the correct ribbon formula. The three main formulas are wax, wax/resin and pure resin. You will need the same amount of the one use ribbons as you have labels. How Many Ribbons Do I Need? Direct thermal labels have a heat sensitive dye embedded in the top layer of each label. When the label travels under the heat generating print head of your printer, the heat in each dot of the print head array activates that dye and your image is formed at speeds of up to 12 inches per second. Since direct thermal paper is sensitive to heat, the labels may need special storage conditions & the "life span" of the labels is limited. 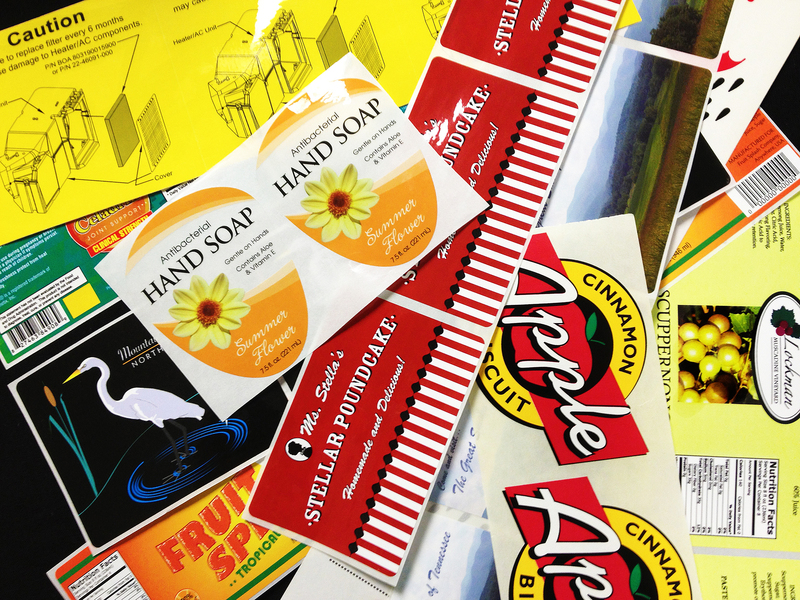 Most experts say that Direct Thermal labels are best if used within 6 months to a year. This is due to the fact that over time they can yellow and become less attractive. But if your application needs are for a short life span label, they offer simplicity of ordering supplies (no ribbon needed) One other advantage of direct thermal labels comes from the ability to over coat each label with a stain resistant material that that keep your label looking its best no matter what. The image is formed under the top surface, so liquids do not stain the label and can be wiped down, leaving your product looking nice. Our labels are guaranteed to stick & print durable, readable bar codes no matter what environment they are in! In addition to custom labels, tags and ribbons in any color, material & size, we offer standard stock labels that are available on a three day turnaround & on some items, next day. Remember, if you do not see your size below, please contact us for your custom made to order media. Your assets are valuable, so make sure you can keep up with them with our custom or standard inventory asset tags. Maybe you have a small budget, why not consider our polyester value tags & labels. Maybe you need tags that can withstand high temperatures. Anodized Aluminum can withstand cold, heat & weather to last for years, even outdoors. Many business are now using RFID Asset Tags to help speed the process.